We live at the western point of Madeira at 500m altitude. We have a huge garden with lots of fruit species and a large vegetable garden. 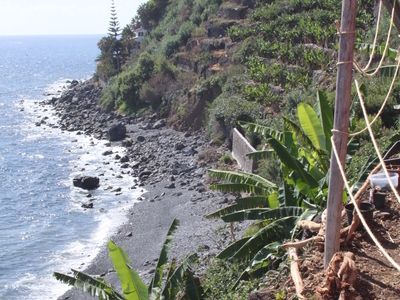 A few years ago we bought some terraces near the sea at Ponta do Sol. This place has higher temperatures throughout the year which made it possible to plant more exotic fruit trees. It is too far for us to taking care in summer so we need someone to live in the hut and taking care of the trees. You , it can be two people, will live alone at our property. We will explain you the tasks on the land which will be mostly watering, cleaning the bananatrees, picking figs, harvesting vegetables. For the watering you use the natural levadawater that comes down from the waterfall. You will have to schedule your day as it is quite hot in summer so better do the jobs early morning or late afternoon. There are lots of fruits and vegetables for your own consumption, we will provide you basic extras so you can prepare your own meals. The hut is quite basic for now, but we would love to get ideas for upgrading. There is no elctricity yet, but we are working on a solarsystem. The terraces are down from the mainroad, steep stairs will take you there. A 15 min walk on the mairoad takes you to the village of Ponta do Sol. Live in harmony with nature and enjoy, while taking care of our little paradise.